Another post about rainbows! After our meeting with FASTA and further discussions with the Loughs Agency(LA) we are asking that anyone who is fishing for this invasive species(Rainbow Trout), please DO NOT USE SWEETCORN! It is against LA rules anyway but with the smolt returning now to the sea it is imperative that it is not used to catch rainbow trout anywhere in the river because if the salmon smolt try to eat it, they will die as they cannot digest it. Please keep this fact in mind . We know that we need rid of the rainbows but we do not want to damage any smolt in the process. 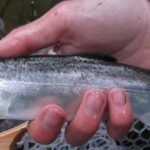 Please can all anglers be gentle with the smolt when handling them as they are fragile and any mishandling could prevent the young salmon making it to sea.